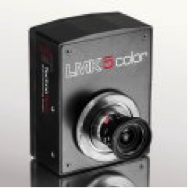 The LMK 5 color is equipped with a glass filter wheel for color and chromaticity measurements, adapted to the CIE color matching functions of the 2° standard observer (CIE 1931). Thus, luminances and color coordinates can be measured in a spatially resolved way. This product provides a complex evaluation of luminous and illuminated scenes by means of the photograph of an image-resolved luminance distribution. In addition, the measuring system can also be equipped with glass filters for the scotopic luminance V´(λ), the circadian action function C(λ), an IR-filter (measurements in the NIR range of 780 – 1000 nm), a BLH (blue light hazard), or a clear glass filter.